This is the first of two GM-Trucks.com 2020 C8 Corvette exclusives. Nice, Look forward to seeing the rest of the car. However this was found, thank you very much for posting it here. 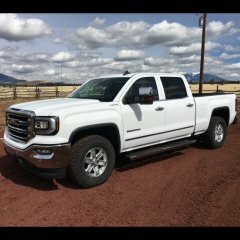 How is www.gm-trucks.com getting stuff like this????? Hey guys. Longtime lurker here. I just noticed that if you go to that GM truck website, the poster of the photos and head honcho of that website is named Zane Merva. I'm guessing that this is Zerv. Not sure how many peeps from this forum go there, but the ZERV saga is quite entertaining. And now they think Zane is Zerv. LOL. I've been on CorvetteForum since 2001.. who's to say I'm not this ZERV dude? Of all that a Corvette is supposed to be, is this logo supposed engage some secret suspension setting, or maybe make the invisible to radar, while still allowing shiney paint? Can't wait to see what the new onstar/satellite looks like, can't be a shark fin on a stingray can it? Been on Corvette Forum it says since Feb. 99. Not quite as often as I used to be, but still enjoy my corvettes over the years. Same user name over there and here. This mid-engine corvette debate has been going on for a long time. Finally, it seems to be happening.